Autoimmune polyendocrine syndrome type 1 (APS-1), also known as autoimmune polyendocrinopathy-candidiasis–ectodermal dystrophy/dysplasia (APECED), autoimmune polyglandular syndrome type 1, Whitaker syndrome, or candidiasis-hypoparathyroidism–Addison's disease syndrome, is a subtype of autoimmune polyendocrine syndrome (autoimmune polyglandular syndrome) in which multiple endocrine glands dysfunction as a result of autoimmunity. 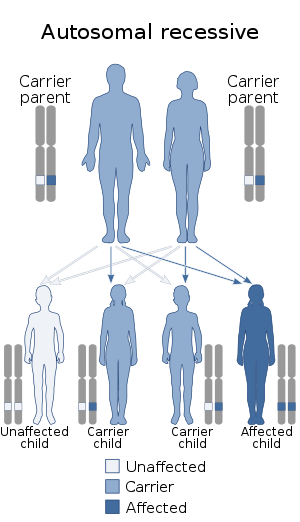 It is a genetic disorder inherited in autosomal recessive fashion due to a defect in the AIRE gene (autoimmune regulator), which is located on chromosome 21 and normally confers immune tolerance. Autoimmune polyendocrine syndrome type 1 is a condition caused in an autosomal recessive manner. Furthermore, it is due to a defect in AIRE gene (which helps to make a protein that is called the autoimmune regulator) mapped to 21q22.3 chromosome location, hence chromosome 21. Autoimmune polyendocrine syndrome type 1 mechanism also indicates that affected individuals autoantibodies have considerable reactions with both interferon-omega and interferon alpha. ^ a b c Reference, Genetics Home. "AIRE gene". Genetics Home Reference. Retrieved 2017-04-04. ^ a b c d "Polyglandular Autoimmune Syndrome, Type I - eMedicine Endocrinology". Medscape. Retrieved 2009-04-17. ^ a b RESERVED, INSERM US14 -- ALL RIGHTS. "Orphanet: Autoimmune polyendocrinopathy type 1". www.orpha.net. Retrieved 2017-04-22. ^ Greenspan, Francis S.; Gardner, David C. (2004). Basic clinical endocrinology. New York: McGraw-Hill. p. 103. ISBN 978-0-07-140297-2. ^ a b Reference, Genetics Home. "APECED". Genetics Home Reference. Retrieved 2017-04-04. ^ Shoenfeld, Yehuda; Cervera, Ricard; Gershwin, M. Eric (2010-06-08). Diagnostic Criteria in Autoimmune Diseases. Springer Science & Business Media. p. 265. ISBN 9781603272858. ^ "Autoimmune polyglandular syndrome type 1 | Genetic and Rare Diseases Information Center (GARD) – an NCATS Program". rarediseases.info.nih.gov. Retrieved 2017-04-11. ^ "Autoimmune Polyglandular Syndrome Type 1 (APS-1) | NIH: National Institute of Allergy and Infectious Diseases". www.niaid.nih.gov. Retrieved 2017-04-16. ^ De Martino, Lucia; Capalbo, Donatella; Improda, Nicola; D’Elia, Federica; Di Mase, Raffaella; D’Assante, Roberta; D’Acunzo, Ida; Pignata, Claudio; Salerno, Mariacarolina (2013-10-23). "APECED: A Paradigm of Complex Interactions between Genetic Background and Susceptibility Factors". Frontiers in Immunology. 4: 331. doi:10.3389/fimmu.2013.00331. ISSN 1664-3224. PMC 3805967. PMID 24167503. De Martino, Lucia; Capalbo, Donatella; Improda, Nicola; Lorello, Paola; Ungaro, Carla; Di Mase, Raffaella; Cirillo, Emilia; Pignata, Claudio; Salerno, Mariacarolina (1 January 2016). "Novel Findings into AIRE Genetics and Functioning: Clinical Implications". Frontiers in Pediatrics. 4: 86. doi:10.3389/fped.2016.00086. PMC 4992815. PMID 27597936. Peterson, P; Pitakanen, J; Sillanpaa, N; Krohn, K (2004). "Autoimmune polyendocrinopathy candidiasis ectodermal dystrophy (APECED): a model disease to study molecular aspects of endocrine autoimmunity". Clinical and Experimental Immunology. 135 (3): 348–357. doi:10.1111/j.1365-2249.2004.02384.x. PMC 1808970. PMID 15008965. Capalbo, Donatella; De Martino, Lucia; Giardino, Giuliana; Di Mase, Raffaella; Di Donato, Iolanda; Parenti, Giancarlo; Vajro, Pietro; Pignata, Claudio; Salerno, Mariacarolina (2012). "Autoimmune Polyendocrinopathy Candidiasis Ectodermal Dystrophy: Insights into Genotype-Phenotype Correlation". International Journal of Endocrinology. 2012: 1–9. doi:10.1155/2012/353250. PMC 3485503. PMID 23133448. This page was last edited on 24 February 2019, at 17:59 (UTC).